Rosalie Lillian Hale is a character in Twilight, a young adult series written by author Stephenie Meyer. Rosalie Lillian Hale was born in Rochester, NY in 1915. She had two younger brothers, a housewife for a mother, and a father who worked at a bank. Her father's job helped keep the family wealthy during the Great Depression. She was born beautiful and thus was constantly praised, making her vain and conceited, and, like her social-climbing parents, wanting more out of life. One day, Rosalie's mother had her dress up to deliver her father's forgotten lunch to him at work, hoping that the son of the bank's owner would take an interest in Rosalie. It worked, and Royce King the Second sent roses to Rosalie and, after making a comment that her eyes were like violets, began sending her those as well. Their relationship was solely based on physical attraction, as Royce was always very busy at the bank. They became engaged, and two months later, just before the wedding, Rosalie visited her good friend Vera, who Rosalie envied for her baby boy, Henry. When she saw Vera's husband kiss Vera, Rosalie finally realized the lack of love in her relationship with Royce. While walking home, Rosalie stumbled across Royce and his friends, who were all intoxicated. Royce bragged about his fiancée's beauty, leading to Rosalie being beaten and presumably gang-raped. Rosalie, whom Royce left to die in the streets, was found by Carlisle, who was drawn to her by the scent of her spilled blood. Taking pity on her, he carried her home and made her a vampire. Three days later, Rosalie's unhappy outlook improved when she saw her beautiful reflection in a mirror. She soon avenged herself by killing all those who had hurt her. Having saved Royce for last, Rosalie donned a stolen bridal gown and found her terrified fiancé locked in a windowless room with a thick, vault-like door guarded by two men. After killing the guards, Rosalie entered the room and tortured Royce to death. She did not, however, drink his blood, and is proud that she has never tasted human blood. While living with the Cullens in Forks, Rosalie plays the role of the twin sister of Jasper Hale (she prefers to use her real last name rather than Cullen). She has a skill for vehicle mechanics and enjoys toying with car parts; she owns a red BMW M3 convertible but usually goes to school in Edward's silver Volvo (as do all of the Cullens) to try and remain inconspicuous. Carlisle believes that a certain characteristic is intensified once you become a vampire; although Edward tells Bella he thinks Rosalie's characteristic is her tenacity, it is most likely her beauty that had been intensified. She is still regretful of being turned into a vampire, even though it saved her life and lead her to her find her true love. Emmett is Rosalie's husband and true love. Rosalie saved him from a bear attack and carried him 100 miles to her home for Carlisle to change him, because she didn't think she could do it herself. In Eclipse, Rosalie tells Bella that she saved Emmett because he reminded her of her friend Vera's son, Henry, with his dark hair and dimpled cheeks. They have been married several times, since Rosalie enjoys the ceremony and the attention that it brings her. She and Emmett sometimes live away from the rest of the Cullens as a newlywed couple. Carlisle found and changed Rosalie with the hope that she would be someone for Edward to love, as Esme was to him, though Carlisle carefully hid this from Edward for many years. But, Rosalie and Edward had nothing in common and have never shared anything more than platonic love. In Eclipse, Rosalie reveals to Bella that she disliked her at first out of jealousy, because Rosalie wishes she was still human. Rosalie reveals that she truly loves Emmett, and has nothing but sisterly love for Edward. When she became a vampire, she was taken aback when Edward wasn't attracted to her, but was never jealous because Edward did not show an interest in any other female vampire either. She admits that she took an immediate dislike to Bella when Edward finds Bella more attractive than Rosalie. 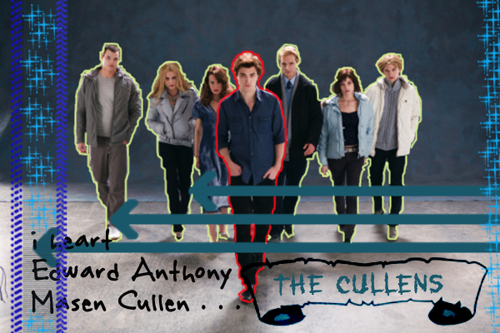 She has also stated that she disliked Edward during her first few years as a vampire, finding him irritating. Rosalie was engaged to Royce in her human life. Rosalie was marrying Royce primarily for financial reasons, and due to her parents' wishes. Two months into their engagement she became aware that there was no love in their relationship, and it ended when Royce and his friends raped and nearly killed her. After she became a vampire, she took advantage of her superhuman abilities and tortured Royce and each of his friends to death. Rosalie is described as being astoundingly beautiful, even for a vampire. She is tall and statuesque, with a figure that rivals a model's. She has wavy blonde hair that reaches the middle of her back, and golden eyes like the rest of the Cullens, which gradually darken to black if she hasn't fed on animal blood in a few weeks. As with other vampires, she has chalky white skin and purple bruises under her eyes. In her human life, Rosalie was described as a woman who had beauty, elegance, class, and eyes like violets. Rosalie is described as being incredibly vain, pigheaded, and jealous about Bella's relationship with Edward, although she is happily married to Emmett. In Midnight Sun, Edward describes Rosalie as "shallow" after seeing that she was thinking about herself after catching sight of her reflection in someone's glasses. She is, however, fiercely loyal to the Cullens, and does come to care for Bella. obviously. everyone thinks really pretty..
Haha. yeah, while reading Twilight i really thought that she was so pretty. Even prettier than Bella... but also a part of me doesn't like her in Twilight because she dislike Bella. denen, she IS beautiful as described in the book, i belive that you don't like the portraying her, right? denEenA wrote: Haha. yeah, while reading Twilight i really thought that she was so pretty. Even prettier than Bella... but also a part of me doesn't like her in Twilight because she dislike Bella. well she did have her reasons. let's just say that Bella is just ya know, understanding..
let's just keep in mind that SHE loves EMMETT, okie? oh yeah.. edward's mine too bella's. jobelalalalala. 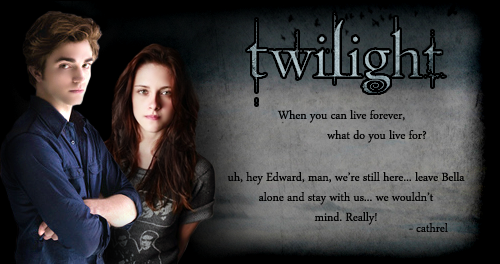 wrote: oh yeah.. edward's mine too bella's. haha im bella's open to sharing..... i think.....? yeah.. i think so too.